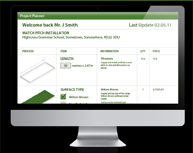 The project planner enables you to build your own quotes online without obligation. Dependant on your requirements it takes you through a series of simple steps to determine your perfect pitch/facility, including base, surface type and cage (if applicable). By registering the system allows you to save your quotes, allowing you to amend, print and email these to other committee members and colleagues. Once you are happy with your final specification you can forward your finished project to us to proceed or simply contact us for further help and advice.